The average rate for 30 year fixed mortgages dropped in recent weeks (Jan 2019) to 4.45%. Despite the often alarming reports that mortgage interest rates are going up, the worst claims are unjustified. Here is an overview of what has happened to 30-year fixed-rate mortgages. This is based on an average for lenders across the country, compiled every week by Freddie Mac, a corporation formed by Congress in 1970 to underwrite home mortgages. In 2016, mortgage interest rates dropped to a record low of about 3.4%. In 2017, rates rose rapidly to about 4%. 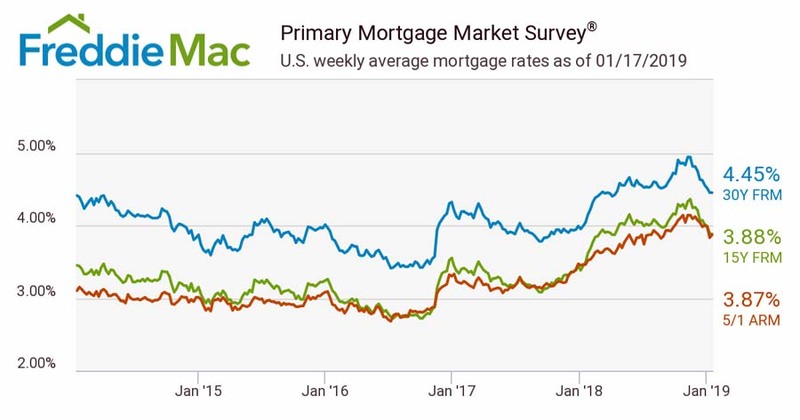 In 2018, rates again rose rapidly to about 4.5% and peaked in November close to 5%. In December 2018, rates began to drop from a peak of 4.94% and appear to be holding at 4.45%, a decrease of 8%. 15-year fixed and 5-year adjustable rates are lower than 30-year fixed rate loans, both at about 3.9%. The mortgage rate is coupled to many factors: the bond market, political climate, world economic conditions, bank profits, the Federal Reserve rate, and more. The predictions in this chart are probably the worst case; the present direction suggests that rates could be lower. However, there have been sudden, large increases in rates in the past: a 24% increase in November 2016 and a 16.5% increase in January 2018. What does a change in mortgage rate mean for you? Each 0.5% in interest rate results in a change of about $300-$325 in your monthly payment for a loan of $1,080,000. A loan less or equal to $726,525 is a conforming loan (for 2019). Conforming loans usually have lower interest rates than Jumbo loans, over $726,525. Amount of down payment relative to the loan. The borrower’s debt-to-income ratio. This is the percentage of your monthly income used for recurring payments, including the new mortgage, car loans, and so on. This should be 45% or lower. The borrower’s credit score and history. The lenght of the loan. It may be worth considering a shorter loan with a lower interest rate. To navigate this complex process, we highly recommend that you consult a professional mortgage broker. We also recommend that you use a local mortgage broker with an established reputation in the community. This can give you the best deal and personal service. An established, local broker can also help you to buy a home when there are competitive offers; sellers and their real estate agents have higher confidence in closing the sale if the mortgage broker is known and respected. Contact Madeline for recommendations.